"What a most delightful evening. The characters were so expertly handled that everyone thought they were real." sang The Bermuda Sun. "The audience sat spell-bound as the magic unfurled before them. We can't wait until this company returns." heralded the Royal Gazette. 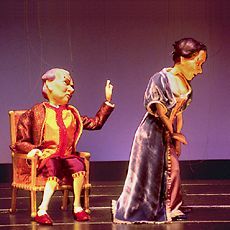 And thus both island newspapers officially heaped praise on the New England Marionette Opera's widely-acclaimed production of The Barber of Seville which dazzled six sold-out houses at the 1996 International Festival of the Arts in Hamilton, Bermuda. Some of opera's most memorable music includes the famous "Largo al factotum" sung by Figaro. Seventeen marionettes are featured in this spectacular production. The recording for this production was made in 1957 featuring Maria Callas and the (London) Philharmonia Chorus. Costumes for the production, which is set in the mid-18th century, are among the most elaborate ever constructed by the theatre. The lead female, Rosina, will wear a corseted gown which is a soft light blue velvet with floral trim. Construction of the gown took almost 94 hours to complete. And much of that time was spent on detail that the audience will never see. For the "boning" in the corset, true New England Marionette Opera ingenuity substitutes collar stays. As usual with marionettes, if there is a need for a costume change, an entirely new marionette must be constructed due to the fact that the operating stings run through the fabric of the costume. Thus there are two separate Rosinas in the production, four Almavivas, and seven Figaros. SEVEN FIGAROS? ONLY the Marionette Opera can make that statement and the reason becomes delightfully apparent to the audience. Sung in Italian with English TransTitles©. This is not a children's show.